What the hell’s the matter with you?” is a question that’s often been fired at me point blank in varying contexts, by an even more varied collection of people. Parents, sibling, employers, and colleagues have all hurled this inquisitive barb in my direction. My answer? Well, in general, I’d suggest that the question is moot. To be honest, I think it’s a strange question, because more often than not, it’s a question that’s asked through a veil of perception that gnaws away at the inquisitors’ sensitivities… or expectations. In fact, I’d argue that it’s not really even a question, but more of a statement of exasperation, spoken by a chafed few who have yet to fathom that there are just some things, situations or people that they can’t control in life. For better or worse, some people have self-destructive tendencies. Maybe the term ‘self-destructive’ is a bit overkill in relation to some, yet on the other hand, its an understatement in relation to others. Nevertheless, in our society’s ever mangling penchant to label and pigeon hold everything, terms tend to have more function than brains. Usually, when non-conformists fail to conform, as is their nature to do so, they tend to be embraced by some and vilified by others. Ok, so it goes without saying that we can’t be loved by all people, all of the time. That’s a given. Regardless of who you are are or what you stand for, some people will love you and some people will hate you… even on principle! For non-conformists, this seems true to the extreme. Yet, there are those odd occasions, when some non-conformists actually succeed in breaking through into dizzying heights of mainstream popularity, much to the dismay of their detractors’ bile. When this occurs, industries spring up around such new found ‘celebrities’ as everyone scrambles to jump on the grandstanding bandwagon to gain purchase, or stranglehold. But wait, it’s gets stranger, as an eventual realignment of sentience takes place. Our society has a bad habit of perverting ‘the unique and different’ in a profane attempt to remould them in its ‘socially correct’ or ‘fashionably sensible’ image. When that fails, then at some point it is inevitable that what goes up must come down… usually in spectacular flames. Indifference sets in as interests turn to seek out ‘the next big thing’ and the ‘haters’ are let out of the closet, and into the arena, to mercilessly pick, peck, poke and point fingers, in true vulture fashion. Ok, so I know that vultures don’t actually point fingers, but well … you know what I mean. Yes, some people don’t want your help, advice, wisdom, or good intentions. Some people just want to be left alone to do ‘their thing’. Last night, I learned that Amy Winehouse shuffled off her mortal coil. She was a phenomenally talented singer and songwriter that bridged Jazz and Soul Music … and defied our expectations, sometimes for the better and sometimes for the worse. Yes, she was troubled, she told us so … and her death, though still unexplained as of this writing, is a tragedy. To me, one’s death is tragic when you don’t see it coming; it’s horrific when you do. Nevertheless, the media, eyes wide shut, has already begun to cliche ad nauseum over her initiation into the ‘27 Club‘, her life defining hit song ‘Rehab‘, and her vices to which have already been attributed to her death, even before any facts have been revealed. But hey, that’s what sells the news, right? On the CNN website, the marketing suits couldn’t wait more than a paragraph into her obituary before inserting an advert to promote an upcoming episode of Dr. Drew titled “How can someone so talented be so self destructive?” Its pathetic. It’s profane. 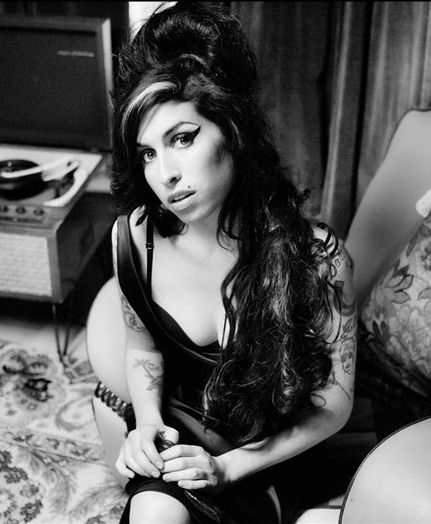 Amy Winehouse was an artist that many things to many people in life… and will continue to be as such in death. I mourn her passing, the loss of her talent, her art and her potential. Of course, there’s much to be said about how she lived her life, but it’s really a moot point now. So I prefer to remember her for what she left us. And yes, it’s true that but for her legacy of music, no one was saved … but I would argue, that the lives of those who were touched by her music were truly enriched. Amy, Amy, Amy – you’ll be missed for all that was and all that could’ve been. PS. Thanks for reading. This is just one of those mornings, I really wish I hadn’t sworn off Baileys in my morning coffee. For this post there’s no questions, because the obvious ‘why’ thunders loudly. Here are some videos of what we lost. If you choose to see only what you want to see, then at least close your eyes and listen. Your comments, as always, are welcome.